It’s the 15th Anniversary! Gather everyone together!! Rock Volnutt: We sure fought long and hard to get here, didn’t we? Rockman X: Yes, very true. Rockman: Hard to believe it’s been 15 years almost! Rock Volnutt: And let’s not forget about the new EXE direction, too! Rockman X: May the Rockman series continue unto eternity. Rockman: Please keep on giving the Rockman series your support!!! 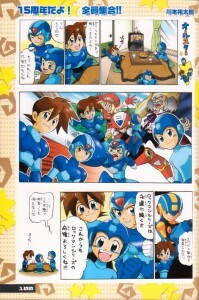 Rockman X: …..Maybe we should have prepared a speech for the occasion or something. I love the idea of our heroes hanging out in their downtime (and the servbot show that X is watching). As much as I enjoy the art and don’t mean to keep pointing out artistic flaws, that fourth panel where she forgot to add Rockman’s earpiece always jumps out at me. Did you guys notice? 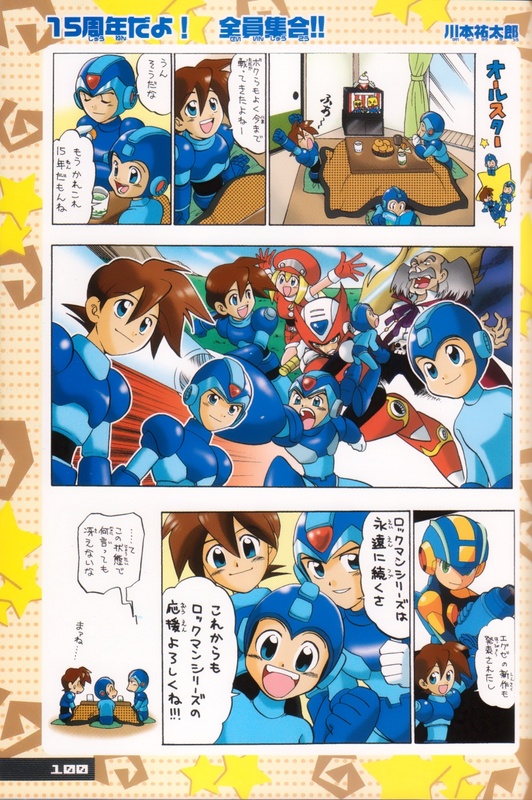 6 Comments to "The Manga of Rockman Perfect Memories, part 4"
All of these comics have been great! Thanks for uploading and translating them! Makes me wish they’d do a new reunion with Mega Man’s…what…7(?) series he has now?? A lot of artists, even Capcom ones, play around with the eye colors, but after doing all the other Mega Mans’ eyes as blue I was surprised she kept EXE’s green.